As a first time dog owner we naturally wanted the very best for our fur-baby. When we first collected Ila we were given the usual starter pack of food that she was given as a puppy. She was fed a mixture of raw and a mainstream brand of complete dry extruded biscuits. We kept her on this diet until a year old (as recommended by our breeder) and decided that we would then research the ‘best’ food for her. We decided that we loved feeding her raw as it kept her in good condition, with a shiny coat and clean teeth and in an ideal world we would have liked to feed her completely on a diet of raw meat and ingredients, however with a busy working schedule, this would not be possible. We decided to keep her on a mixture of raw and complete biscuits, with the bonus that if we ever forget to prepare her raw food, she can always have just the complete biscuits. 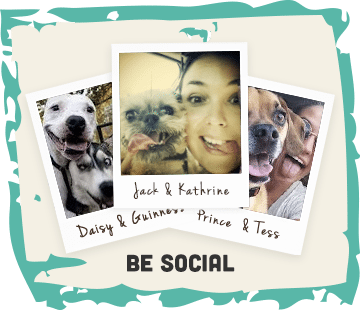 With Ila having an active Instagram account it was only a matter of time before we stumbled across the hype of Guru Pet Food. Many of the dog accounts we followed were giving so much positive feedback about the food (and the excellent reviews we found online), that we just had to investigate further! 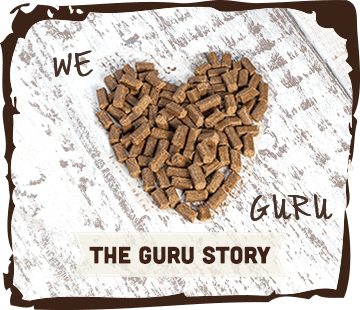 We discovered that Guru Pet food is cold pressed, therefore; it retains a lot more nutrients than extruded biscuits; is much more dense (requiring a smaller portion per meal); and includes lots of yummy ingredients we already loved supplementing to Ila’s meals (brown rice, sweet potato, carrots, cranberries… to name a few). There are also many people who recommend that biscuits and raw meat should not be fed together as they are digested at different rates (something we discovered amongst our research). 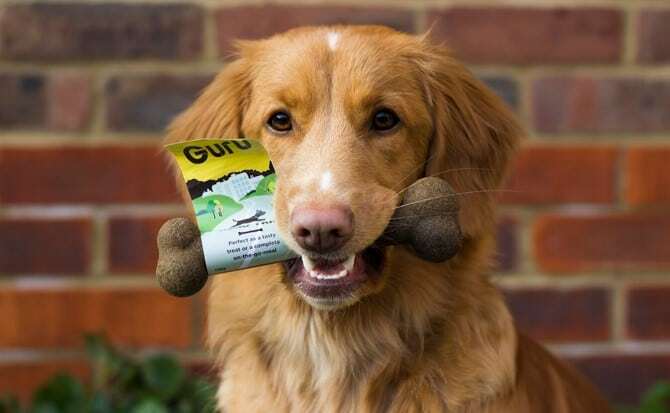 Guru, as a cold pressed dog food, breaks down faster than extruded dog food, similarly to the rate of raw food. Making it a great mixer! I enquired to the Geekster team about feeding Guru alongside raw and they explained that many of their customers do this already with great results. Ila is in no way a fusser eater (I won’t go in to details about the various things she considers as ‘food’), however she responded to Guru like it was one of her favourite treats – an immediate hit! We took the plunge and ordered a full bag of Surf and Turf. We have not looked back since! We still love to feed Ila on a raw diet, but feed it 50/50 with Guru Pet Food. This means we do not have to spend hours preparing her food, we do not need to worry about ensuring we include the right nutritional contents (as Guru is a complete meal) and if we forget to defrost her food she can just have Guru! Additionally, her coat is beautifully shiny, her muscle tone is incredible and she loves the taste of her Guru Pet Food. Better still, when we are off on adventures or competing at shows, we can simply take a trip bone to feed her as a complete meal. No more measuring out biscuits and worrying about keeping raw meat frozen! 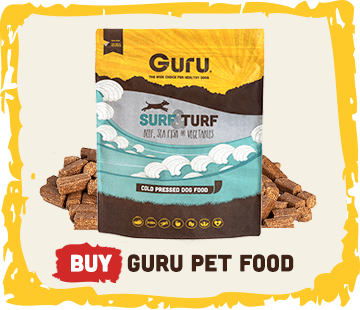 We cannot recommend Guru Pet food enough!